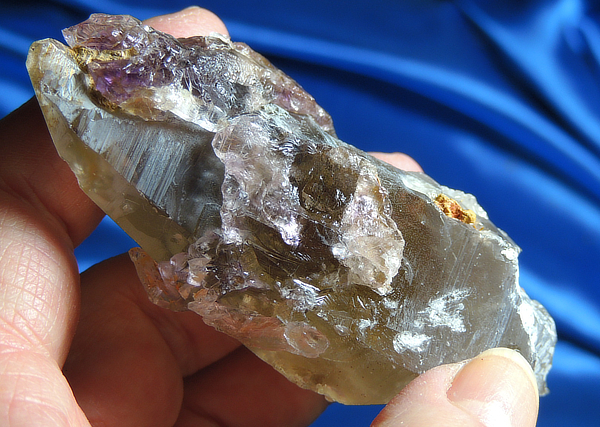 This is an extraordinary crystal wand is from Espirito Santo, Brazil. My supplier called these “halo amethyst” as her amethyst accents her like a halo and it looks for the world like rose quartz, save the light violet color with a very pinkish tinge. As I was taking her pictures, her generally smoky appearance shifted to a light gold … and her general color is amazing! Her termination clearly shows the secondary growth that beautifully spills off the termination and around the side creates amazing glyphs. A side is chlorite eroded (white chlorite) and healed and there is a bit of golden healer here and there as well as some crystal caves. You simply must explore her with a loupe to savor her stunning crystalline expression (as well as to see the loads of little splays of star rutile inside and believe me, they are evident with the loupe – like little stars within her!) and then take her into meditation to explore the layers of her energy … and then you will understand why she is a Shaman’s Torch … and that is only enhanced by her general torch shape! She would work well with a Healer or a Keeper in a healing crisis. She weighs 3.1 oz and is 3.4” by 1.4” by 1.1” of beauty and love! She is terminated all over but has a small ding on a side and another near the base that do nothing to effect her loving energy! As beautiful as this Spirit is, she has equally beautiful energy, sweet and as ethereal as an angel’s song. When I first saw her, I wanted to instantly place her over my Third Eye and that was expansive and amazing. Then, I placed her over my heart and it was there that she felt most at home. I’ve seen the amethyst flowers and they are wonderful, but when you have one like this, there is profound awakening to sensitivity that is badly needed in this life’s expression. She has the heart involvement and the sweet clarity and wisdom of amethyst deftly guiding the process. She will help her Keeper gently search out and incorporate positive change into the Self. Her heart is an anchor, reminding her Keeper that the heart must be the true temper of any change. It is within the heart that you both know what is necessary and what must be done for the betterment of Self. She is one Spirit you will want to meditate with over and over and over! And, then you understand why a Shaman would seek out a crystal such as this to better understand the people she/he serves.